A little while ago I worked with Eat Well to review a Yumbox in a bid to make Emily's lunches more fun. Eat well are a company who import and distribute a range of unique and stylish products including Yumbox, Tidy Table Tray, Lunch Punch, and Lunch Box Love. 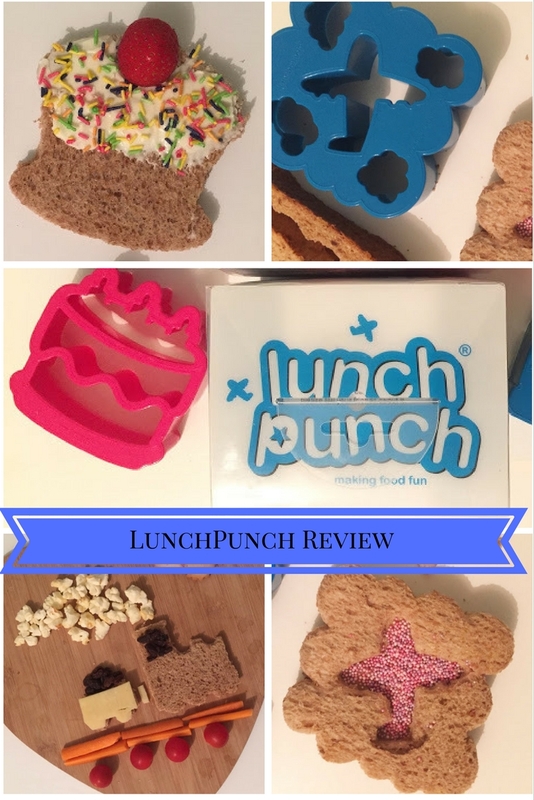 With that in mind I was given the opportunity to review some LunchPunch cutters, Finding appealing finger foods for toddlers can be tough, so I was happy to receive some help. I was sent two different packs, and have been using them for the past couple of weeks. Emily has really enjoyed having different shaped sandwiches, and it has encouraged her to eat more than she normally does. I have wanted to make sandwiches more fun for Emily for quite a while, but I had never found a product that could do that with little waste. I have tried different cookie cutters, but many of those cut away too much of the sandwich. The first pack I was sent was the VRRRM! set, this includes four transportation themed cutters. Of course this pack is Emily's favourite, if you know Emily you will know she adores vehicles. Especially trains. The pack includes a car, an airplane in clouds, a truck with cargo, and a train with truck shapes. The second pack is the Sweet set, this includes four sweet treat themed cutters. This includes a cupcake, a birthday cake, ice cream cones and gumball machine shapes. The more detailed cutters such as the ice cream cones, require a little bit more practice and patience. I have really enjoyed using the ice cream cone cutter on fruit too, as the imprints show up really well. In my opinion the best feature of the Lunch Punch is that it generally leaves most of the sandwich and cuts off the crust. Each Lunch Punch pack includes a set of 4 cutters which come beautifully boxed to make the perfect gift. The Lunch Punch is a food cutter specifically designed to capture the most amount of bread when it cuts the crusts off your sandwich. This creates a fun lunch with minimum waste. The cutters are taller than normal cookie cutters, making it easy to cut through two slices of bread and spread while still keeping sandwiches light a fluffy. There is nothing worse than a squished sandwich. The Lunch Punch was invented by a mother of young children to make lunch more fun for everyone, as every parent knows, it is a daily challenge to make a healthy and appealing lunch that kids will eat. Sandwiches can be boring, and most children like my own don't like crusts, These lunch punch cutters are the perfect solution. Lunch Punch cutters are dishwasher safe, and BPA Free. I was kindly given a pack of lunchpunch to giveaway, for your chance to win enter below. - I was sent this product for the purpose of the review, however all opinions are my own.